Professor Edmund Burke is leading the team of Stirling researchers. A major £2.8 million project led by Stirling and Lancaster University teams, which will focus on tackling UK airport congestion, is announced today. The project will examine the better use of existing capacity and resources – rather than sole reliance on new airport building and expansion – resulting in benefits to both the industry and travellers. 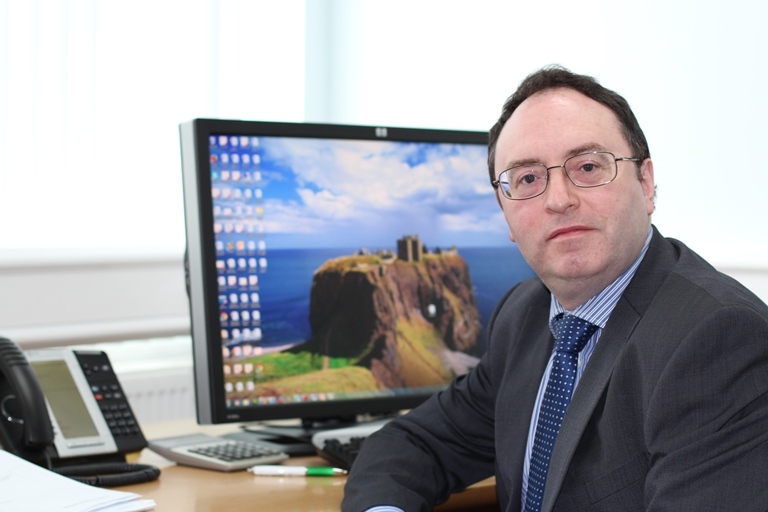 Professor Edmund Burke, Senior Deputy Principal and Deputy Vice-Chancellor, will lead a team of Computing, Science and Mathematics researchers at the University of Stirling in the OR-MASTER Programme Grant (Mathematical Models and Algorithms for Allocating Scarce Airport Resources). They will work on the EPSRC-funded (Engineering and Physical Sciences Research Council) research with colleagues from Lancaster University Management School. The six-year study comes amid growing concerns over airport capacity, rising demand, and the impact of congestion on both the travelling public and the air transport industry. Professor Burke said: “It is recognised that as economies grow and as the need for air travel grows, greater capacity at airports is required. We are delighted to receive this grant, which will investigate - from a mathematical and computational perspective - whether capacity management is being realised as efficiently and effectively as possible. The work will build on the UK's world-leading expertise in Operational Research to find the most efficient ways to schedule flights, developing and testing new models and solution algorithms that take into account all the factors involved in the allocation of flight 'slots': individual airport operations, networks of airports, airline operations, air traffic management systems, airport authorities, civil aviation authorities, airlines and the travelling public. Project lead, Professor Konstantinos G. Zografos at Lancaster University Management School, said: "Existing approaches to airport slot allocation do not consider all the real-world complexity involved. Therefore, there is room to improve airport capacity utilization which will benefit airlines, airports and the travelling public. Professor Gerry McCormac, University of Stirling Principal and Vice-Chancellor, said: “Professor Edmund Burke’s research is globally renowned. This multimillion pound award, which he and colleagues from Lancaster University have received from the EPSRC, will address congestion at airports around the world. OR-MASTER will involve close collaboration between the two Universities and a host of international organisations, who will provide real-world data, insights and expertise. The project represents a strong partnership between academia, the air transport industry and policy makers. The project will create opportunities for 12 new researchers – six at each institution - to gain experience with international research centres and air transport industry organisations. Professor Edmund Burke's research interests lie at the interface of Operational Research and Computer Science. He is a member of the EPSRC Strategic Advisory Team for Information and Communications Technologies and the UK Computing Research Committee (UKCRC). He is also a Fellow of the Operational Research Society, BCS - The Chartered Institute for IT and the Institute of Mathematics and its Applications. Professor Burke is Editor-in-Chief of the Journal of Scheduling, Area Editor (for Combinatorial Optimisation) of the Journal of Heuristics, Associate Editor of the INFORMS Journal on Computing, Associate Editor of the IEEE Transactions on Evolutionary Computation and a member of the Editorial Board of Memetic Computing. Since 1995, Professor Burke has led the organisation of the international series of conferences on the Practice and Theory of Automated Timetabling (PATAT), and has played a leading organisational role in several other major international conferences in his research field. Professor Burke has edited/authored 14 books and published over 250 refereed papers. He has been awarded 57 externally funded grants worth over £17m from a variety of sources, including EPSRC, ESRC, BBSRC, EU, Research Council of Norway, East Midlands Development Agency, HEFCE, Teaching Company Directorate, Joint Information Systems Committee of the HEFCs and commercial organisations. At the University of Stirling, OR-MASTER will be undertaken by the CHORDS (Computational Heuristics, Operational Research and Decision Support) research group. Formed in 2011, it explores and develops computational search methodologies and models that emerge from studying the complexity and uncertainty of real world scheduling, optimisation and decision support problems. Members have strong connections with leading UK universities and internationally-renowned industrial partners. The project is led by Konstantinos G. Zografos, Chair Professor at the Department of Management Science at Lancaster University Management School. International organisations involved in OR-MASTER are: National Air Traffic Services (NATS) in the UK; Eurocontrol (managing air traffic across Europe); Park Air Systems; KLM Air France; Zurich Airport and Athens International Airport; the research organisations linked to the national air navigation services for Italy and Spain (SICTA and CRIDA); SESAR (Single European Sky research body); the Airport Services Association; Goldair Handling; ACI Europe (Airports Council International); the HALA! SESAR network of leading researchers in Europe working in the area of Air Traffic Management automation; NEXTOR II (National Centre of Excellence for Aviation Operations Research); the MIT International Centre for Air Transport Research (MIT-ICAT) in the USA; and DLR, the German Airspace Research Centre.